The third largest of the Great Lakes of North America, Lake Michigan covers an area of 58,016 square kilometers. 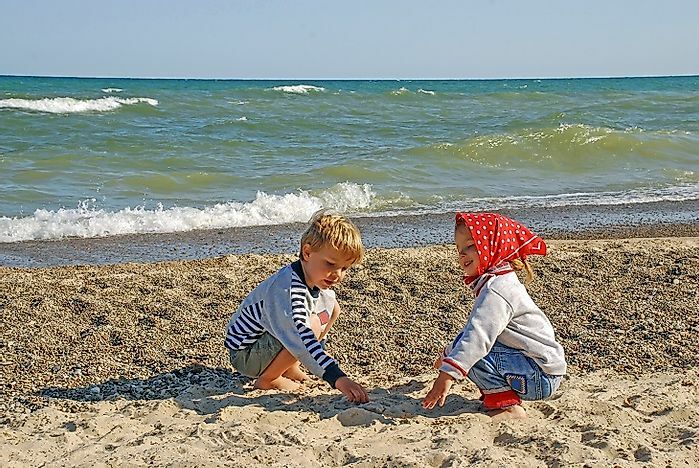 Children play along the shores of Lake Michigan in Indiana. With a drainage basin of 118,000 square kilometers, Lake Michigan is the third largest lake among the five Great Lakes of North America. The lake is located entirely within the boundaries of the United States, bounded by the U.S. state of Michigan to the east and north, Indiana to the southeast, Illinois to the southwest, and Wisconsin to the west. The Strait of Mackinac, situated to the east of Lake Michigan, connects Lake Michigan to Lake Huron. In terms of water volume, Lake Michigan, with a volume of 4,920 cubic kilometers, ranks second among the Great Lakes after Lake Superior. The maximum depth of the lake is 923 feet. Around 100 rivers and streams drain into Lake Michigan, and it also hosts a number of islands in its northern end, of which Beaver Island is the largest one. Lake Michigan was probably formed around 1.2 billion years ago with the split of two tectonic plates, resulting in the generation of the Mid-Continent Rift. The Hopewell Indians and, later, the Late Woodland Indians, were the earliest inhabitants of the Lake Michigan region. The first European explorations in the region began in the 17th Century with the arrival of the French explorer Jean Nicolet sometime between 1634 and 1638. During this time, the lake area was occupied by descendants of the Woodland Indians, including the Chippewa, Sauk, Miami, Ottawa, and other Native American tribes. With the establishment of a fur trade route through Lake Michigan to the other Great Lakes, a number of European trade posts like Fort Michilimackinac and Fort Mackinac sprung up along the shores, and in the islands, of Lake Michigan. In the 19th Century, Lake Michigan played a significant role in shaping the economy of Michigan and other Midwestern states in the United States. Lake Michigan has its own history of shipwrecks, with around 360 shipwrecks having been located in its deep waters. Nearly 12 million people reside along the shores of Lake Michigan, and depend on the lake’s water for their supply of drinking water. Major industrial centers have been established near the lake since the water of the lake facilitates the transport and trade of industrial raw materials and processed products. These include iron ore, coal, and limestone. Like the other Great Lakes, Lake Michigan is also an important source of commercial fishing, with its fisheries and fish processing industries supporting the livelihoods of thousands of local Americans. It is estimated that the Great Lakes generate around 1.5 million jobs in the U.S. every year. Besides fishing, the tourism industry in and around Lake Michigan is also well developed, and many small cities and towns in the lake's area have a local economy largely supported by tourism. The beautiful beaches and islands of the lake, the venues for sport and recreational fisheries, water sport activities, and cruises all render Lake Michigan as a major tourist attraction. The waters of Lake Michigan support a variety of fish species and other invertebrates. Lake trout, Panfish, Small-mouth bass, various Catfish species, and Yellow perch are some of the native species of the lake's habitats. Invasive species like Sea lampreys, Round gobies, Zebra mussels, and Alewives are also found in these waters, and are held responsible for declines in the populations of native aquatic fauna and flora. Brown trout, Coho, and Chinook salmon were introduced into the waters of the lake to lower the number of invasive species, and are now constituting some of the most prized catches of sports fishermen operating in the lake. Besides fishes, the lake also hosts a large number of water birds, including swans, ducks, and geese, as well as such predatory birds as vultures, Bald eagles, and hawks, alongside other types of birds still. The introduction of non-native invasive species like the Asian carp has posed the greatest threat to Lake Michigan's ecosystems. The large sized Asian carp, already detected in the Chicago River, if introduced into Lake Michigan will diminish the plankton populations of the lake, for which it has a massive appetite, thus disturbing the lake’s food chain system. Climate change also makes the lake susceptible to significant losses of its cold-water fishes. The rising temperatures also threaten to lower the water level of Lake Michigan, and increase the incidence of storms in the region. Pollution of the lake, though kept under strict control, still occurs, and more recently threats from tiny, microscopic strands of plastic discovered in the lake's waters have managed to alarm the scientists. These strands of plastic are predicted to have belonged to petroleum-based fabrics which have been washed down the sewage drains when clothes are laundered, ultimately ending up in the waters of the lake.